Orlando Pabotoy. Photo Credit: Hunter Canning. Ma-Yi Theater Company bills itself as the “primary incubator of new Asian American plays” in the country, supporting young and emerging Asian American theatre artists. 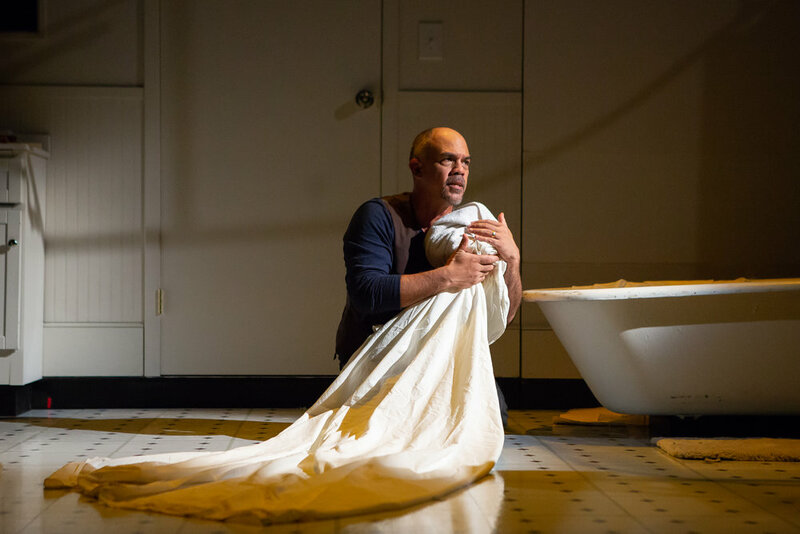 “Sesar”, their latest commission, is a moving solo show of personal memoir, smartly written and performed with élan by Julliard-trained actor and NYU Tisch School of the Arts faculty member Orlando Pabotoy. This original work is based upon Mr. Pabotoy’s own childhood in The Philippines and Fiji, as the son of an American Peace Corps volunteer and the Mayor of De la Paz, Cortes, Bohol. Forced to leave his homeland by the “People Power Revolution” of 1986 sparked by the assassination of Benigno Aquino Jr. and culminating in the removal of dictator Ferdinand Marcos and installation of Corazon Aquino as president, the Pabotoy family arrived as refugees in Fiji only to endure two more military coups there in 1987. A testament to the enduring soft power of American entertainment and the continuing resonance of William Shakespeare’s plays, as a 15-year-old-boy, Mr. Pabotoy saw Christopher Plummer recite a speech of Cassius’ from “Julius Caesar” while guest starring on an episode of “The Cosby Show”. Immediately seduced by the words and the style of their delivery, he obtained a copy of the mysterious play, and locked himself in the family bathroom daily for months for hours on end, memorizing the speech and honing his own oratory with the sink running to muffle the sound. When his father, an exiled politician, discovers what Mr. Pabotoy has been doing in the bathroom (somewhat relieved it hasn’t just been masturbation), the two embark on a poignant and touching dramaturgical deconstruction of Shakespeare’s “Julius Caesar”, studying the story, trying to understand the characters, practicing the speeches, and drawing the parallels of what happens to a nation in transition of power from Ancient Rome to The Philippines and Fiji—assassinations across centuries mirroring one another. With great flourishes of physicality and flights of theatricality, gleaned from his Commedia dell’arte background, Mr. Pabotoy sharply embodies multiple characters, primarily his younger self and his father, over the course of this 60 minute play directed by Richard Feldman. Junghyun Georgia Lee’s realistic white monochrome bathroom set, framed by a black expanse, provides the perfect backdrop for Dan Scully’s video projections, which add a vital contextual foundation of historical atmosphere. The story is sweet and profound, particularly when Mr. Pabotoy’s father draws on his own experiences to unpack “Caesar” for his son, offering a contemporary resonance that brings a nearly 400 year old text to life, and when Mr. Pabotoy reflects, years later, on the sacrifices of manual labor his father made so that his son could live in America. The middle portion of the play, that father-son bonding experience, plateaus where it should build, but is saved by Mr. Pabotoy’s engaging performance and the digestible running time of the piece. At its most intimate, “Sesar” is a tribute from one son to his father; at its most grand, the play speaks to the universality of both Shakespeare’s literature and the lessons to be drawn from history—whether burning in the heart of a 15-year-old boy locked in a bathroom in Fiji, or shared in a compelling one-man show on Theatre Row. Long live Caesar/“Sesar”! Bottom Line: Ma-Yi Theater Company presents “Sesar”, a moving solo show of personal memoir smartly written and performed with élan by Orlando Pabotoy. As a young Filipino boy seduced by Shakespeare’s “Julius Caesar”, this play is the sweet and profound story of how that text bonded a son and father together during a time of political strife in Asia.